In modern companies terms like “life- cycle benefits”, “work- life balance” or “family policy” are often to be heard. 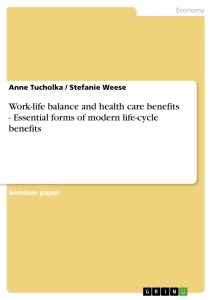 Before getting into detail about the topic “Work- life balance and Health Care Benefits – essential form of modern life- cycle benefits” the definition and the importance of those benefits should be pointed out. Life cycle benefits are defined as a part of the compensation package offered to the employees according to their part of life cycle; which means for instance to their age or their social situation. More generally spoken they are “designed to meet the needs of employees throughout the stages of life”. Normally these are additional payments and services to the salary or wage. It is part of the motivation programme of a company. Therefore it also belongs to the organisational strategy. A company has to think about how to get new qualified employees and how to maintain and encourage the working staff. The benefits can be financial or non- financial. Sometimes they are also defined as in- kind payments for the employee’s membership and participation in the organisation. Their purpose is to provide protection against health and accident related problems, to ensure income at retirement and to offer discounts, educational assistance and child and elder care. Today’s working situation is under real pressure. There are a lot of different influences and requirements to the employer as well as to the employees due to socio- demographic, socio- cultural and economic changes. Nowadays there are more single- parent families, two- earn families and aging parents to be found. Furthermore, the aging workforce is a case in point with significant effects on the working situation. Several firms, such as “Stahl und Technologie Konzern Salzgitter AG” pronounce that the average age in their company will rise from 42 to 47 till the year 2015. It would follow that ¾ of the employees will be older than 40 and about 40% will be older than 50. Coincidently, there are young people missing. In the end fewer and older employees who will have to work longer (compare to the German law proposal of retirement at the age of 67) are at the company’s disposal. That is why companies have to establish new forms of benefits respectively working conditions. Another aspect is the woman who wants to work and to have children. To guarantee both, child care, day care options will have to be included in the company’s strategy. Moreover, the payments to the Social Security System have risen. The companies have to cover high costs for their employee’s insurance and even more costs if employees get ill. The risk of accident/ health related problems has risen, too so that health benefit costs rose by 6.1% in 2006. About 750,000 people need to take working days off because of work related illness. This results in about 300 million working days lost a year. These extreme figures may be linked to the aging workforce and to the stronger working requirements and tasks. At the economic point of view most companies are part of a very strong competitive market. They are under the pressure of producing more at the best quality. Because of globalization there are more and more low cost producing countries. The economic power often is achieved at the expense of social and healthy work environments. Nowadays overtime work, organizational stress and lower payments are no exception. In order not to loose qualified staff firms introduce new kinds of programmes and services related to the needs of their employees. In the next two chapters family policies, health care benefits and their impact on the companies shall be pointed out. These two forms of life-cycle benefits are getting more and more importance for the Human Resource Management as it is announced in several magazines such as “Personalwirtschaft”. On the following pages the reader should get a review over the possibilities of internal family policies and health care, the different parts of these beneficial systems, their outcome and advantages. Having handled the single parts, it should be clear that the coverage of family affairs and health care is essential for modern life-cycle benefits and for the success of a company. The term work-life-balance is often to be heard when talking about modern family policy. Most people understand it as the compatibility and harmony of family or private life and the working life. In general it is the balance between different parts of life. However, they are not fifty-fifty and therefore, it is a dynamic term. This means the importance of different aspects like family and job changes daily, weekly or in other periods of time. In relation to enterprises it is often understood as family-friendly policy which means support in child care and care for older people as well as their implementation. Work-life-balance is a modern tool to react on changes concerning demography and society. According to the introduction, especially the population in Germany becomes more and more older and young people are missing. The creeping changes of the social value system now show results. Nevertheless, the wish for children is still to find, but people, especially women hesitate to give birth to a child. There are several reasons for it. On the one hand, most women try to make career and be financial independent. Emancipation can be heard everywhere. Therefore, they do not want to make a break to found a family because this would mean a break in their working development and in their income. On the other hand, the stability of today’s long-term partnerships is not very high, so most women do not risk being a single parent. Another factor is the fear to have such a high responsibility for another person. A child needs a lot of time, love, stability, security, money and of course the right social environment to grow. One of the most important aspects is that enterprises and government do not enough for a growing number of births. Parents often feel left alone with their financial problems and complicated time management. The organization of family and work life often overextend the people but the wish for work and a high lifestyle is mostly higher than the wish for a family, so they decide to work. The following charts are results of the Generations and Gender Survey 2005 used by the Robert-Bosch-Study about the desire to have children and underline the foregoing theses. They make clear that a diversified policy could change the behaviour of women, especially those who already have a child but also childless ones. This varies from a changed opinion about the eventuality of having a child to the discussion about the number of children. This is very important because 66 percent of women between 20 and 49 living in an relationship think that theirs professional chances by a birth become worse whereas just 2 percent think this will improve them. But as mentioned before, worse working possibilities are not the only reasons for a childless relationship. Very decisive is the aspect of a secure work place and the fear for private restrictions whether concerning lifestyle, labour time or money. Less important are things like insecurity with regard to the relationship and the stay of health. cp. Streb/ Lome, Personalwirtschaft 02/07, p. 36 ff. Der Marketing Management Prozess. Analyse der Netflix, Inc.